Choosing a daycare or preschool can be tricky – they all seem the same, right? But look a little closer and you’ll find they’re not identical. Selecting the right one for you and your child can make all the difference, so to help you pick a winner be sure to look for these telltale signs. The last thing you want is your precious bub being in some kind of cold institution every day where no one cracks a smile or gives a warm hug. Suss out the staff by chatting to them and looking around; if there’s a generally frosty vibe going on then perhaps this isn’t the best place. You want carers who are going to look after your child almost as lovingly as you would, and this is probably the most important thing to tick off the list. There’s nothing worse than standing in a childcare centre and seeing heaps of babies wailing and unattended, or toddlers with dirty nappies or super snotty faces being left to their own devices. You want attentive staff who cater to the children’s needs, comfort them when they’re upset and play lots of fun games. When checking out the other children though, just remember that spotting a teary child doesn’t necessarily mean there’s something wrong with the centre, so be sure to look at the general demeanour of kids as a whole. This sounds simple enough but is a good thing to check out. We’re not talking about paint splatters on the floor or sand in the shoes, but things like whether the bathroom and eating areas are hygienic and whether all the rooms are as tidy as they can be with lots of small children creating havoc. Look for signs up about nut-free zones or special food allergy menus, or simply ask the centre manager. You never know when your little one might develop an allergy, intolerance or a special need that requires extra care and assistance, and so it’s a good idea to know up-front how flexible your daycare is when it comes to specific child requirements. You need childcare that’s either close to your home or work, because there’s nothing worse than being stuck in traffic and being late or not able to get there quickly if your child’s ill. Don’t underestimate the convenience factor, so even if you’ve found an amazing preschool that’s further away, maybe it’s not going to work out. 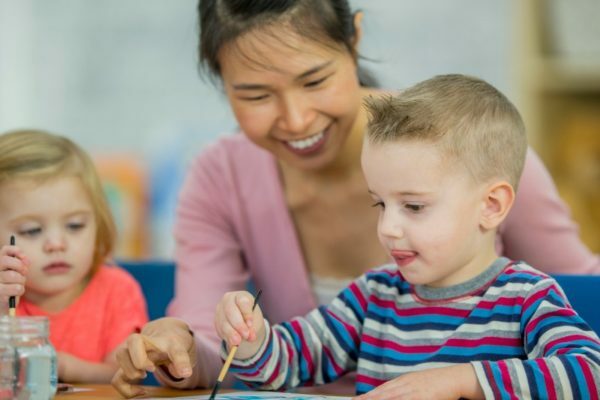 And thinking carefully about choosing a centre near work over home if your child is going to school soon – ideally you want her to graduate preschool with kids she’ll be seeing the next year at Big School. Look on the walls for education or training certificates to see how many of the staff are qualified. While a kind, caring nature is important, it’s also important to know that the carers are trained professionally to help with preschool learning and development, and experienced in all areas like first aid and toilet training. You don’t want a centre full of work experience kids. This is a really sneaky way to tell if a preschool is good or not – ask about the staff. Are they all casuals or are many permanent employees who’ve worked there for years? Good staff will stay in a place that’s good, so if there are some stayers, that’s usually a good indication that the centre is a great place to both work, and send your child. You don’t want to have to move your child around different daycare centres until they go to school. Some centres don’t accept babies or those not toilet trained, while others do newborns to age six but they excel in care in one age group rather than all. So think about how long your child might be needing daycare and look for a centre that caters for all ages well, particularly in that final year before they go to school. You want your child to be as school-ready as possible. Some daycares seem quite cheap but delve a bit deeper and you might find you’re having to fork out for all nappies and lunch, which can not only bump up the cost but also the hassle. It’s pretty common to have to supply a piece of fruit or vegetable, but anything more than that and it’s downright annoying. Also be sure to look into hours of operation and what sorts of fees you’re up for if you’re late for pick up or your child’s sick. This is the final and most telling sign of them all – whether other parents who have children at the centre love it. If you don’t know anyone whose child goes there, don’t feel shy about stopping another parent at the gate and asking them. Most will be happy to give their honest opinion. Otherwise use Facebook local community pages to post questions about a centre and watch the feedback roll in. If other parents and their children love it and can give you solid reasons why, then chances are it’s going to be the right place for you too.